When I imagine my ideal future life, this is my typical weekday: I work all day at my fulfilling job (until a reasonable hour like 4 pm of course), then I come home and cook up a delicious, creative, fresh meal (with all of the high-quality ingredients I can't afford now) while I leisurely enjoy a glass of wine and a charcuterie/fresh fruit plate with my husband. We enjoy dinner while John Legend is playing on the stereo, the windows are open and there's a slightly salty breeze coming in, and our dog is running around by our feet. After dinner, we go for a long walk, hand-in-hand, talking about our days and planning out our upcoming trip to Greece. Okay, am I getting carried away? Really though, these are the dreams getting me through grad school. So just let me have it, okay? Being able to cook complex and creative dinners regularly is definitely part of my dreams. I truly enjoy cooking -- the recipe development, the prep work, the chopping, the sautéing. But right now, I don't have as much time for it as I'd like. Sure, I cook most of our meals, but I have to rely on *quick and easy* much of the time. Like this tabbouleh crusted salmon, which came together in 20 minutes with 3 main ingredients and virtually zero effort. I mean, this was EASY. Honestly though, this might be a recipe that I keep in my back pocket *even if* I find myself with more time and energy and money one day. It was goooood, regardless of how quick and easy it was! Tabbouleh is a whole grain Mediterranean side dish made with bulgar, parsley, olive oil, lemon juice, garlic, and usually chopped tomatoes, cucumbers, and onions. It's relatively simple to make yourself, but I like to buy the prepared kind from Costco or Trader Joe's because it's easy and just as tasty. 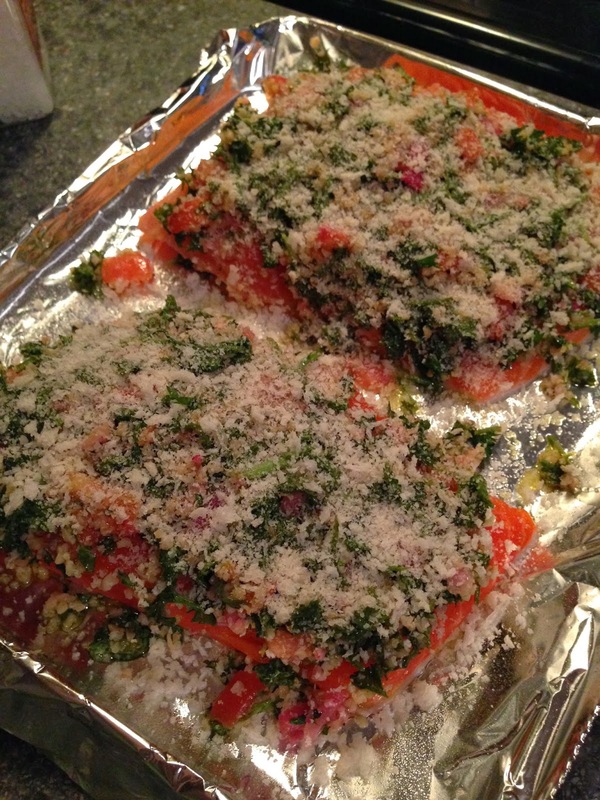 While I usually eat tabbouleh as a side dish (i.e., with the meat on top of it or beside it), I had an idea to bake it on top of these beautiful fresh salmon fillets with a bit of panko bread crumbs. 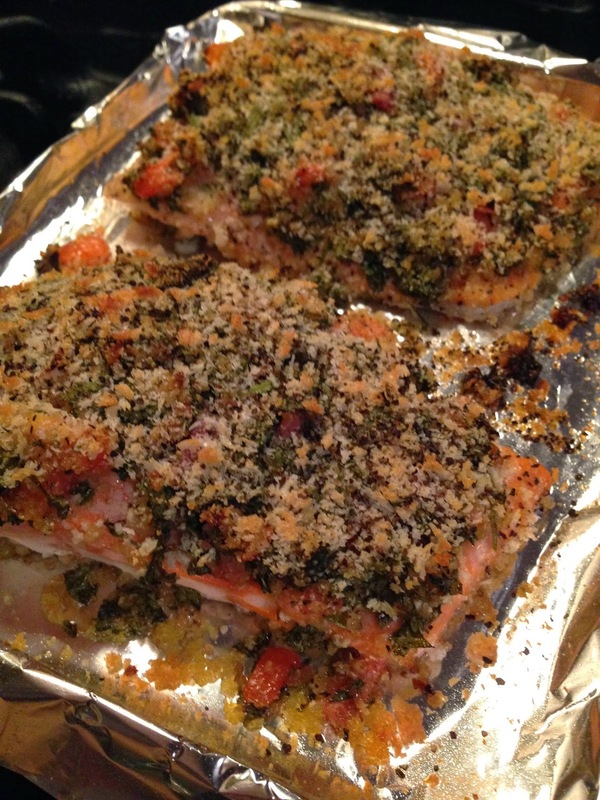 I was hoping it would turn into a flavorful crust that paired well with salmon... and it did! With all of the nice flavors of the tabbouleh -- especially the lemon -- and the slightly crunchy panko with the flaky baked salmon, it basically melts in your mouth. This is a seriously easy, seriously healthy and nutritious, and seriously fast meal. If you have salmon, prepared tabbouleh, and panko, then you'll have dinner ready in 20 minutes (with approximately 1.5 minutes of "work"). Serve with a side salad or veggie and you're good to go! 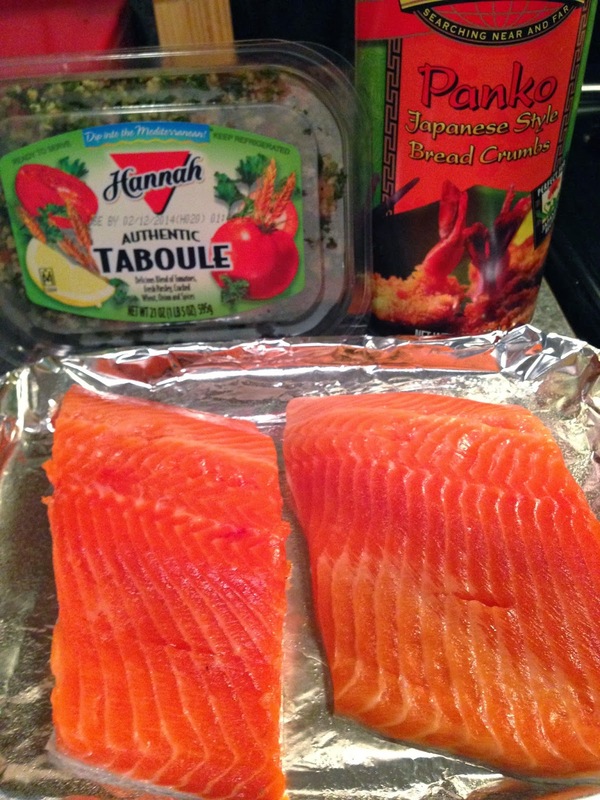 Gather your main players: two fresh salmon filets, prepared tabbouleh, and panko bread crumbs. You'll also need extra virgin olive oil and salt and pepper. 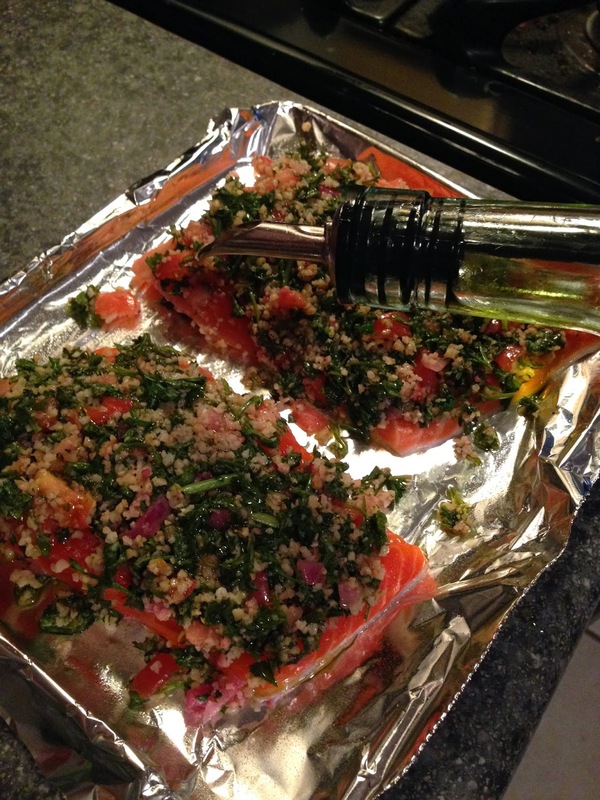 Lay the salmon out on a foil- or parchment-lined baking pan sprayed lightly with cooking oil. Top each filet with about 1/4 cup of the tabbouleh. Top with panko. Season liberally with sea salt and cracked black pepper. Place in a 425 degree oven for about 15 minutes. Then, toil the broiler on for 2-3 minutes, or until the crust is starting to brown. Make sure the fish is flaky and cooked through. That's it! You're done! Enjoy! -Place salmon filets on a foil- or parchment-lined baking pan sprayed lightly with cooking oil (skin side down if your filets have skin). 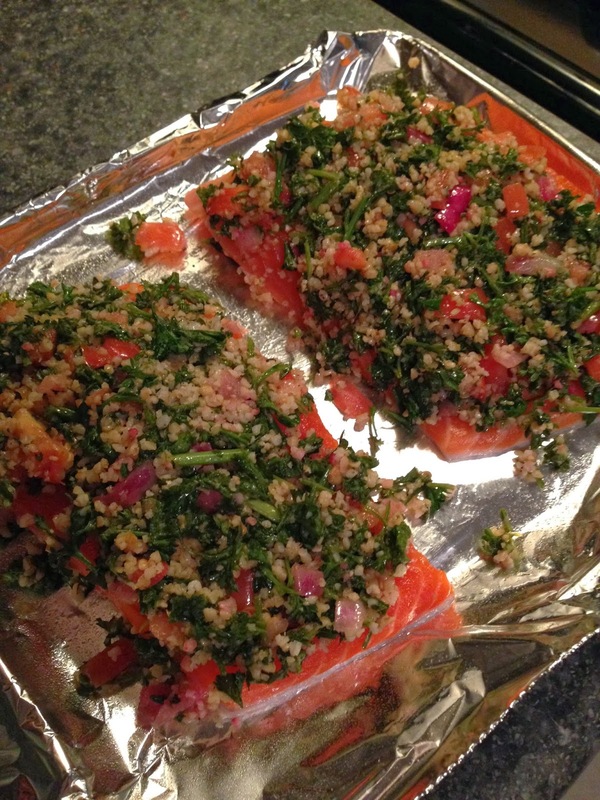 -Top each filet with about 1/4 cup tabbouleh. -Drizzle the filets with olive oil. -Sprinkle about 1 tbsp of panko onto each filet. -Season the filets liberally with salt and pepper. -Bake for about 15 minutes. Then, turn the broiler on for 2-3 minutes and cook until the crust is slightly browned and the fish is cooked through and flaky.